The biggest menu change is that Dandelion Cafe is now 100% vegan, with no dairy or animal products in any of their menu items. 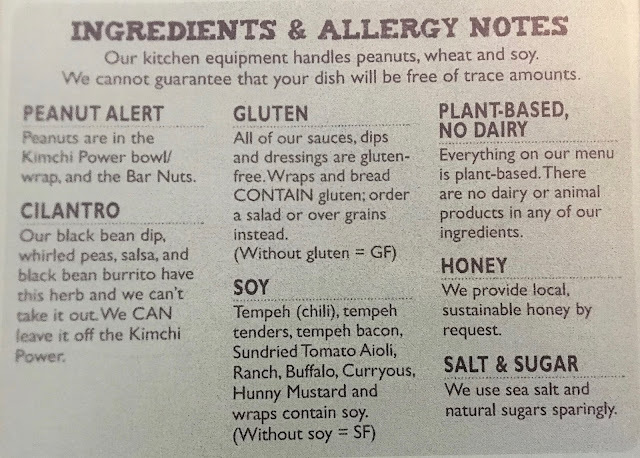 Previously, Dandelion did have some dairy-containing ingredients (like cheese), but this transition means that everything is now safe for vegans and those with vegan, shellfish, seafood, and egg allergies. 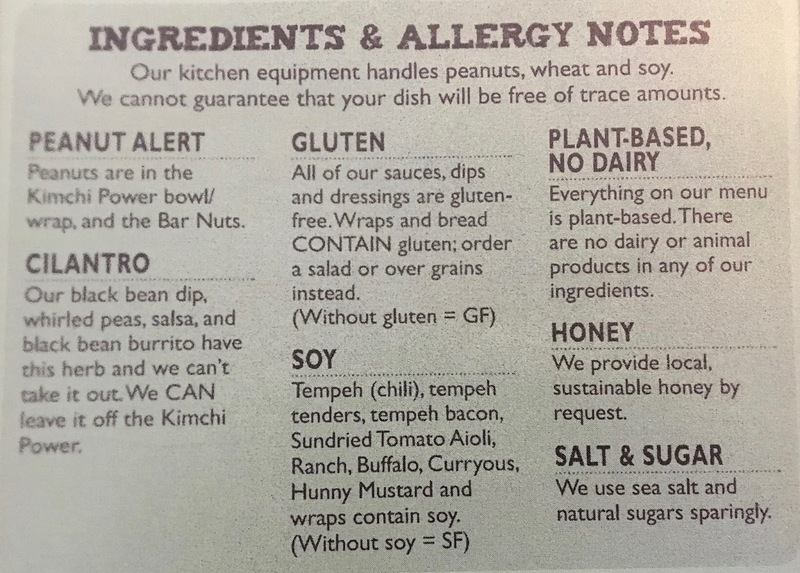 The only gluten-containing items are wraps and bread, but any item can be served as a salad or over grains instead. For other concerns, check out this helpful guide below. Whenever I go to Dandelion Cafe, I have to order their teas of the day, which are served in a bottomless capacity. The day I visited, I ordered the happy hibiscus, which had a bold, concentrated hibiscus flavor (fruity). It's served hot or cold, and honey is available on request as a sweetener. For my entree, I actually ordered an appetizer, because it was one of Dandelion's new dishes: the falafel lettuce wrap. It came beautifully prepared, with a side of green goddess dressing to add as desired. The dish was served relatively room-temperature, which was okay, given the heat of the day. The falafel is filling and dense, with the chickpeas taking center stage with a hint of lemon present as well. 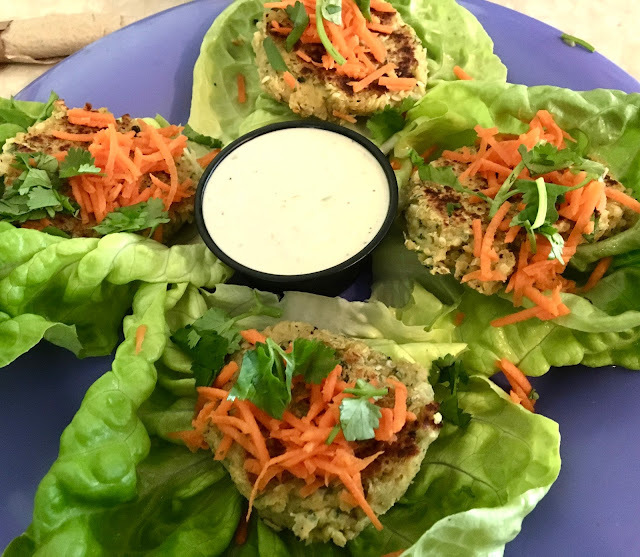 The lettuce is cool and sturdy, and can take a folding or two to serve as a lettuce wrap. The green goddess dressing was boldly garlicky and added a nice flavor that gave the wraps extra zing. Although it didn't look like a lot of food, the real ingredients used mean that I was quickly satiated with the shown portion. As an additional note, the falafel can be ordered as a protein on any of Dandelion's salads. As a side, I also ordered their whirled peas guacamole. It's stood the test of time as my favorite thing on Dandelion's menu, and I cannot go to the Cafe without ordering it. 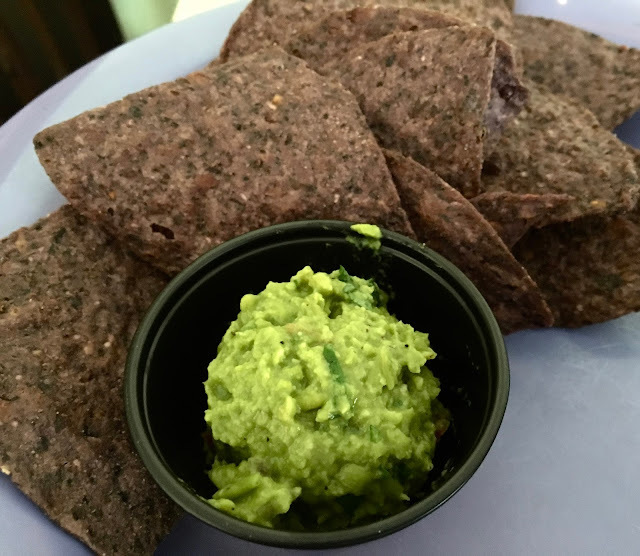 As a side, it comes with blue corn chips for dipping. This guac is untraditional in the sense that it is not made with avocados, so don't try to compare it to the traditional version. Dandelion's is chunky and sweet with notes of tomato and red onion complementing the pea. The chips provide a nice salty, crunchy dipping vehicle, but my only complaint was that there were far more of them there there was dip to go around. For $3, the portion is a on the skimpy side. Of course I couldn't leave without eyeing the pastry case near the register, which normally contains locally-made sweets such as Heartsong Cookies' gluten-free and vegan cookies. 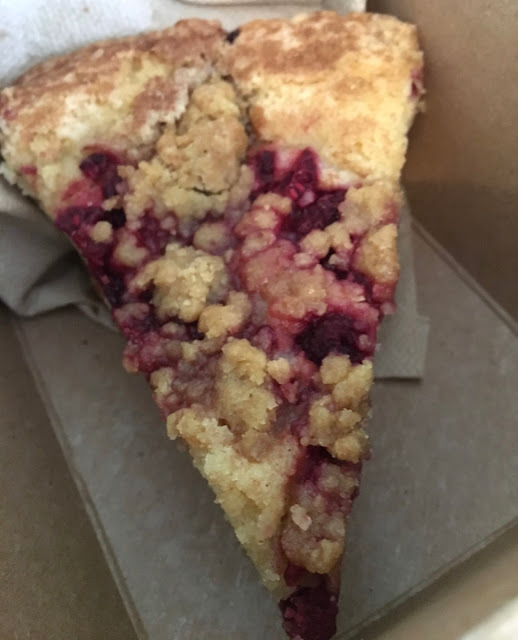 This time, a beautiful berry coffee cake caught my eye, and when I inquired, I was told it was gluten-free, vegan, and made in-house at the Cafe. On my last visit, Dandelion was not making baked goods in-house, so this was definitely a new development. The cake was sweet and relied on the power of fresh berries for its bold color and sweet/tangy flavor. The crust itself was dense, sweet, and cinnamon-y, which was totally decadent and indulgent. I was highly impressed, and it made for the best ending to lunch with my mom. 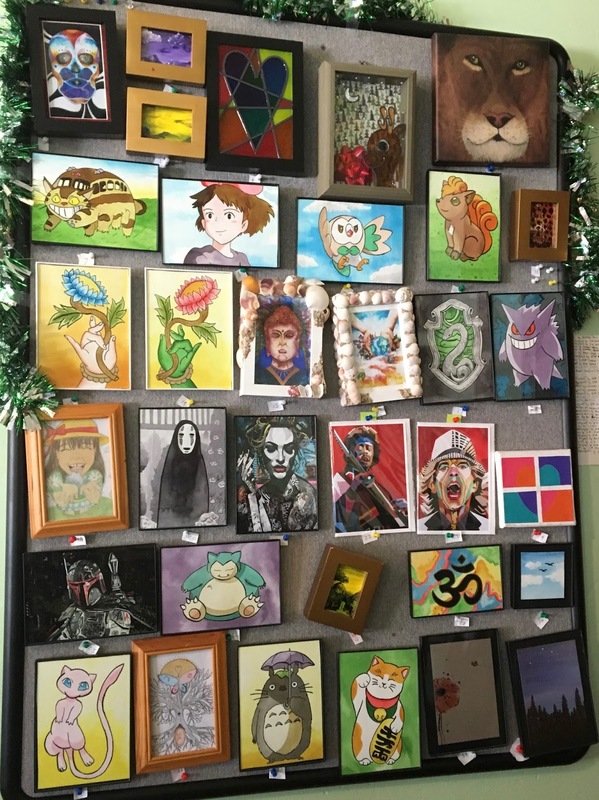 Art by local artists hangs around the restaurant, and you can even buy the pieces to take home to bring a piece of the cafe home with you. 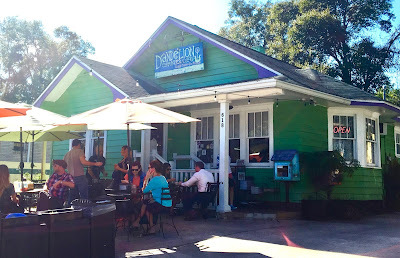 Dandelion Cafe definitely proved to me that they still deserve the crown as one of my top restaurant picks in Orlando (even more so now that they're totally vegan). With impossibly fresh flavors and nutrient-dense menu offerings, eating here not only tastes good, but feels good too. Magic is made by the combination of good food, good people, and local consciousness, and this trifecta is achieved beautifully here. Think Orlando's food scene is all chicken tenders, overpriced burgers, and fries? Think again.